Tottenham Hotspur vs Newcastle United: Tottenham will be hoping to extend their seven-point lead on the chasing pack as they look to consolidate their place in the top four when they take on Newcastle at Wembley. Spurs came from behind to beat Watford 2-1 in midweek, with Heung-Min Son and Fernando Llorente on target. Son is back from the Asia Cup after South Korea were knocked out, which is a timely boost for Mauricio Pochettino. Harry Kane is injured, therefore Son will be key in ensuring Spurs can challenge in the Premier League and the Champions League. Had Tottenham lost in midweek, it would have been their third-straight defeat at home, having lost to Wolves and Manchester United before then. Over the course of the season, they have been quite strong at Wembley, so I wouldn’t read too much into their recent struggles. Newcastle produced one of the biggest shocks of the season in midweek as they beat Manchester City 2-1. Despite having just 23% possession, Rafael Benitez’s side secured a famous result, thanks to Matt Ritchie’s late penalty. The Toon’s squad have been boosted by their new record signing, Miguel Almiron, who will play in the number ten position. It’s the first time Newcastle have broken their transfer record in 14 years – Michael Owen had held the record beforehand. They have won just one of their last four away games and with the club just five points above the relegation zone, that is a run they will be hoping to end. Andre Marriner is the referee for this fixture. The Englishman has officiated 13 top-flight matches this season. In that time, he has accumulated an average booking points total of 32.3. Therefore, I would advise a maximum of 50+ total points for this fixture. Tottenham will have been majorly boosted by their comeback win in midweek. Newcastle will be buoyed by their victory, similarly. However, I fancy Spurs to get the win in this one, despite their recent patchy form. 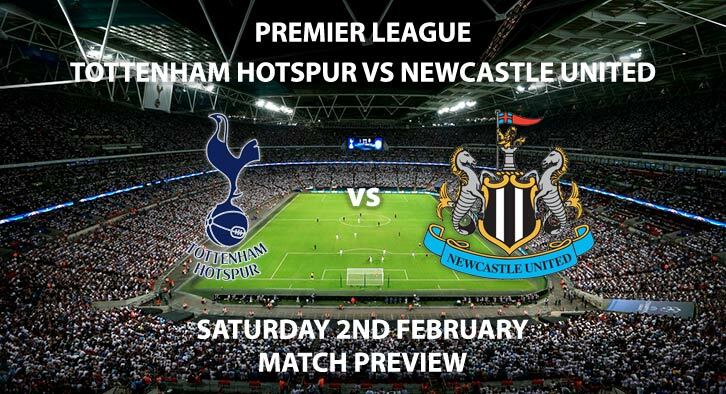 Tottenham Hotspur vs Newcastle United will be televised live in the UK on Sky Sports Premier League with kick off at 12:30 GMT. Correct score: Tottenham Hotspur to win 3-1 – (link no longer available). First Goalscorer – Heung-Min Son – (link no longer available). Anytime Goalscorer – Matt Richie – (link no longer available). (Boosted on SkyBet). Previous RequestABet Winner – Tottenham to score 2+ goals, 5+ Tottenham corners and 20+ Tottenham booking pts – 9/2. RequestABet Specials 80/1 and above – Tottenham to win, 9+ Tottenham corners and Dier & Rose to be carded – 80/1. Price Boost – Christian Eriksen to score from outside the penalty area – 13/2. Double Up Price Boost – Son Heung-min and Christian Eriksen to have 2+ shots on target each (was 5/2 NOW 5/1) – 5/1. Odds and markets last updated on Saturday 2nd February @10:31 GMT. Keep checking back to see if there’s any updates to markets – the time stamp in the previous sentence for when we update tips on this page will be updated.